Flash Thompson as he appeared in Amazing Fantasy #15 (August 1962). Art by Steve Ditko. Corporal Eugene "Flash" Thompson is a fictional character appearing in American comic books published by Marvel Comics. He is a star high school football player who mercilessly bullies his high school classmate Peter Parker but greatly admires Spider-Man, an irony in which the superhero takes some gratification, though he and Peter become close friends in college. After graduation, he joins the United States Army and is haunted by his combat experiences, leading to alcoholism. After losing both of his legs in the Iraq War, he was bound to the Venom Symbiote as Agent Venom, a superhero and the first to control the organism. The character has appeared in several other media adaptations, usually in his earlier bullying incarnation. In film, he is portrayed by Joe Manganiello in Spider-Man, Chris Zylka in The Amazing Spider-Man, and Tony Revolori in Spider-Man: Homecoming. Created by writer Stan Lee and artist Steve Ditko, Flash Thompson first appeared in Amazing Fantasy #15 (August 1962), the same issue Spider-Man first appeared in. He was a recurring character in The Amazing Spider-Man series for several years. The character made his first appearance as the new incarnation of Venom in The Amazing Spider-Man #654 (February 2011). Then a second volume of Venom was started in May 2011 with Flash Thompson as the titular character. As Venom, he appeared as a regular character in the 2010-2013 Secret Avengers series, from issue #23 (April 2012) through its final issue #37 (March 2013). As Venom, he appears in the new 2012 Thunderbolts series by Daniel Way and Steve Dillon. In his early appearances, Eugene "Flash" Thompson was a high school classmate of Peter Parker. In high school, Flash was a stereotypical jock who continually bullied Peter. Flash was physically abused by his alcoholic father Harrison Thompson, leading to Flash's own violent, bullying nature. Thompson dubbed Peter with the derogatory nickname "Puny Parker" and humiliated Parker daily in front of the whole school. Ironically, Flash admired Spider-Man (Peter Parker) and formed the first "Spider-Man Fan Club" and vocally supports his idol wherever he goes, even criticizing J. Jonah Jameson and the Daily Bugle editorials to his face. When Spider-Man was seen committing robberies, Flash was one of the few to stand up for him claiming that he could still be innocent. It soon turned out that Spider-Man had been framed by Mysterio and Flash boasted about how he was always right. Peter, who openly stated that he would not "trust [Spider-Man] any further than I can throw him", took some secret pleasure in that Flash supported his alter-ego. In a very early issue, Flash and Peter squared off for a boxing match in the school gym. Initially expecting an easy victory, Flash was astonished to discover that he simply couldn't lay a hand on Peter (due to his opponent's enhanced speed and reflexes), and a single tap from Parker's fist knocked him clear out of the ring. After this episode, Flash's bullying was restricted mostly to verbal harassment. Over the next few years, as the two became rivals for Liz Allan's affections, Flash was only willing to confront Peter when he (Flash) was surrounded by his friends. Peter, began to laugh off his threats with good-natured comebacks (much to Flash's annoyance as well as bewilderment). This subtle reversal of their positions was typical of Lee-Ditko character developments in the title. Towards the end of Ditko's run on the title, Flash was employed mainly as comic relief, more a local buffoon than a serious threat. Major changes in his personality took place subsequently to issue 39, when John Romita, Sr. took over as artist for The Amazing Spider-Man. Following Romita's take in place, Flash was made into a more sympathetic character and his clean-cut image was similarly emphasized to give him an "All-American" persona. After Flash Thompson entered Empire State University, his relationship with Peter Parker became progressively less hostile. While the two still traded the occasional insult, Flash had grown to respect Peter's intelligence and was surprised by his popularity with the girls, particularly Gwen Stacy and Mary Jane Watson. Both Flash and Peter were friends with Harry Osborn. Harry's presence served to defuse the tension between the former rivals. While in university, Flash joined the United States Army and serves in the Vietnam War (although this was later retconned to unspecified overseas conflict due to Marvel's sliding time scale). Unlike many students of the time, Flash was never conscripted—instead, volunteers for service of his own free will. Although Flash was absent from the strip for months at a time, his frequent stateside visits kept him familiar with the readers. He returned from the war a decorated hero. Flash's tour of duty profoundly changed him from a reckless and immature youth to a tormented and conflicted man. Finding no comfort in his military decorations, Flash turned to alcohol for years. While in Vietnam, Flash's unit bombed an ancient temple whose acolytes had earlier sheltered Flash when he was wounded. Flash tried and failed to stop them. When he returned to America, he dropped his antagonism toward Peter. Peter, in turn, began to respect Flash's new found maturity and the two became close. However, Flash soon finds himself tailed by mysterious assassins, former acolytes of the temple who thought that Flash had betrayed them. Spider-Man held off the assassins long enough for Flash to explain his side of the story. Sha Shan, the leader of the assassins, forgave Flash and even dated him for a while, but left him when she found out he was cheating on her. When Sha Shan was attacked by the Hobgoblin, Flash made the mistake of insulting the villain on television. Hobgoblin took revenge by abducting Flash and framing him as Hobgoblin's true identity. Spider-Man was aghast that his old friend was a villain, but Flash was legally exonerated when Hobgoblin's true identity was revealed. After a bout of severe depression, Flash went drunk-driving and was badly injured in a car crash. Soon afterward Norman Osborn offered him a job at Oscorp as his personal aide in order to annoy Peter. Not knowing the reasons behind this, Flash became loyal to Norman for giving him a second chance and turning his life around. During this time, Flash met the hero Prodigy, not realizing he was also Spider-Man in disguise. Later, as part of a plan of driving Spider-Man to murderous violence by attacking his family and friends, Osborn kidnapped Flash (under the pretense of picking him up from an Alcoholics Anonymous meeting), force-feeds him whiskey and has him crash a truck into Midtown High School, where Peter works. Flash survived, thanks to his excellent physical condition, but he suffered severe brain damage that left him in a coma. Liz Allan Osborn, although widowed and raising her son Normie all on her own, became Flash's caretaker, and hired a full-time nurse to care for him. Peter, blaming himself for what happened to Flash, makes a point of visiting his friend as often as he can. Flash awakens from his coma during the "The Other" story arc. Flash takes a job as the physical education teacher at Midtown High School, where Peter teaches science. However, Flash suffers from severe memory gaps and again treats Peter like a nerd and picks on him, as he did in their high school days. Flash also flirts with Miss Arrow, unaware that she is a villain there to attack Peter. When Peter unmasks himself as Spider-Man, Flash dismisses it as a trick. Flash eventually believes Peter is Spider-Man after witnessing him fight with Daniel Berkhart and Francis Klum. 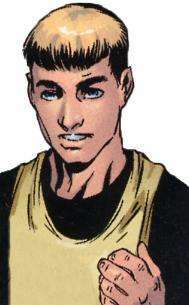 Flash briefly appeared at the beginning of the "Brand New Day" story arc, attending a welcome home party for Harry Osborn. Flash and the rest of the world's population no longer remembers that Peter is Spider-Man, due to the machinations of the demon Mephisto. After the events of "One More Day", Flash Thompson willingly leaves his place as a P.E. instructor to rejoin the Army and fight in the Iraq War out of patriotic zeal, inspired by the selfless life of his lifelong idol Spider-Man. He is still in a close friendship with Peter Parker, as he is seen, lying in his hospital camp bed, with a greeting card by his best friend, and an iPod loaded by Peter himself with "Christmas in Fallujah". Flash's platoon is ambushed, and Flash suffers several bullet wounds in both legs but continues on in an attempt to save his superior officer from danger. He willingly endangers himself, reasoning that Spider-Man had often committed the same sacrifices for everyone else, and glad to have had the opportunity to imitate him. His actions further damage his legs. This results in the need for them to be amputated below the knees. Flash's sacrifice is enough to earn him a recommendation for the Medal of Honor. He returns to New York, only to shock Peter with the loss of his legs. He reveals to Peter that Spider-Man was his inspiration in Iraq. Harry rents a condo just for Flash, in order to help him out. He later competes in a paraplegic sporting event at the local YMCA, managing to come in first place. Flash later accepts an offer to join Mayor Jameson's office of veteran's affairs. He attends the wedding of May Parker. When the Chameleon (disguised as Peter) meets Flash at the subsequent press conference, he cruelly mocks him, calling him "puny Flash". Flash is seen going through the so-called "stages of grief" backwards, even so far as to use dangerous experimental procedures to regain his legs, but seems to come to terms with his condition, thanks to the support of his friends, family, and his new rehabilitation trainer Sha-Shan. 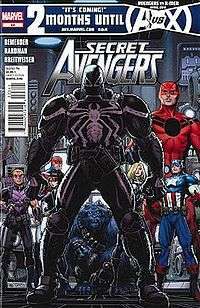 Flash Thompson as Agent Venom on the cover of Secret Avengers #23 (April 2012). Art by Arthur Adams. In a January 2011 interview with Newsarama, Flash Thompson was revealed "by accident" as the new host of Venom. Marvel confirmed Flash will have his own comic using a military style version of Venom. Despite previously seeming to come to terms with the loss of his legs, Flash jumps at the dangerous offer of being bonded to the Venom symbiote, as the alien will be able to replace his legs with its own bio-mass, allowing him to walk again. He will star as a hero working for the military, and he will encounter many heroes and villains of the Marvel Universe. He made his premiere as Agent Venom in The Amazing Spider-Man #654 (February 2011), and continues in his own Agent Venom ongoing series following the special The Amazing Spider-Man #654.1 issue. He cannot stay bonded to the Venom symbiote for more than 48 hours at a time, or the symbiote may gain complete control of him. The consequences of this are first seen when the suit causes Flash to go berserk and brutally slaughter a group of enemy operatives during his second mission, and again during a brawl with the Jack O'Lantern ending with the suit putting a grenade in Jack O'Lantern's mouth. While on a mission in the Savage Land, Flash finds himself being hunted by Kraven the Hunter who mistakes him for Spider-Man. During Spider-Island, Agent Venom is sent in to capture a spider-like beast that is fighting Firestar and Gravity. Agent Venom manages to capture the Spider-King and discovers that he is an enslaved Captain America. Venom disguises himself as the Spider-King in order to track the infestation to its source. The Queen and Jackal send him to kill Anti-Venom because he is curing people who have gained spider-powers, but his superiors order him to take him to Mr. Fantastic to help develop a cure. Flash and the Venom-symbiote fight each other because Flash wants to bring Anti-Venom to Mr. Fantastic and the symbiote wants to kill Anti-Venom for previously rejecting it. This leads to Venom and Anti-Venom fighting. Venom wins the fight and delivers Anti-Venom to Mr. Fantastic. Venom teams up with Red Hulk, X-23, Ghost Rider, and Johnny Blaze to fight Blackheart. He joins the Secret Avengers as Agent Venom. As an Avenger, Flash apprehends the Human Fly, but the Human Fly escapes via a prisoner transport to The Raft when the new Hobgoblin attacks the transport trying to kill the Human Fly for stealing money from the Kingpin. Flash tries to assassinate the third Crime Master for threatening his family, but Eddie Brock attacks him as he is about to fire. This causes the Crime Master to have his new Savage Six attack Flash and Betty Brant. While trying to protect Betty from Jack O'Lantern he reveals his identity to her. Thunderbolt Ross recruits Venom to be part of his Thunderbolts team. Flash relocates to Philadelphia after fighting the U-Foes there. While trying to capture a serial killer infected with some of the alien technology the U-Foes were trying to sell, so Beast could try to cure the man, he is attacked by Toxin. Flash returns to New York when Betty Brant contacts him with information that the Crime Master has resurfaced. Flash infiltrates and attacks Crime Master and his men until the Superior Spider-Man (Otto Octavius's mind in Spider-Man's body) and his Spiderlings intervene. Crime Master then reveals himself to be a small-time hood who had purchased the name and mask from Hobgoblin and turns himself in. Superior Spider-Man then turns his attention to Agent Venom with the intent on destroying him. Flash escapes in a puff of smoke and hides in a hospital before going to Peter's apartment. Seizing opportunity, "Peter Parker" invites Flash to his company to give Flash prosthetic legs. After doing so, Superior Spider-Man detains the symbiote in a cage from which it soon breaks free and bonds to Superior Spider-Man, becoming the Superior Venom. The symbiote tries to flee back to Flash, but Superior Spider-Man keeps it for himself, even going as far as to injure Cardiac when Cardiac tries to separate them. Iron Man arrives to Parker Industries to assist both Cardiac and Flash in order to take him to the battle-zone and reunite him with the symbiote. The Avengers are starting to fall against the power of Superior Venom who boasts about his superiority until Iron Man arrives to distract him allowing Flash (wearing Iron Man's armor) attack from behind and attempt to retake the symbiote. With the unexpected assistance from Spider-Man's conscience, the Venom symbiote finally leaves Superior Spider-Man's body and reunites with Flash, bonding together again. The Avengers are still in disbelief about Superior Spider-Man's argument until they ask Flash to check his mind-link with the symbiote to see anything wrong about Superior Spider-Man's motives. Flash replies that he sees "two different radio stations playing in the same frequency". Following the conclusion of The Superior Spider-Man and the return of Peter Parker as Spider-Man, he learns that his friend Flash is Venom and became angry at the Avengers that they did not tell him. The Avengers confess that because Flash was a good soldier and the secret identities in the Avengers' rules goes both ways. Seeking to maintain a connection with the Guardians of the Galaxy, the Avengers placed Venom on said team as their new envoy. At a point the Symbiote began to act strangely considering anyone as an enemy as something was tapping into its mind signalling it. Flash became extremely worried and, since he was left behind when the other Guardians were captured, he began to try to find a way back to Earth which the Symbiote encouraged. However, in its fear it killed people if they refused. Eventually Gamora found them but they attacked her thinking her as an enemy. Star-Lord manages to subdue the Symbiote but Flash goes into a coma. The Symbiote breaks out on the ship and takes the ship to its planet of origin. The planet of Symbiotes explains to the Guardians their origins of the Klyntar. However, Flash and the Venom Symbiote have created the perfect savior the Symbiotes want. This heals the Symbiote and allows Flash to tap into the full potential of the Symbiote. During the Civil War II storyline, Flash faces-off against the new Spider-Man, and repeatedly subdue him for not being the Spider-Man he knows. Prompting Miles to electrocute him with the Venom Blast, which blasted him into the open. When Flash is first introduced, he is going off on a date with a girl named Sally. She is later revealed to be Sally Avril in Untold Tales of Spider-Man. In that series her relationship with Flash is portrayed as less flirty and more friendly. In high school he dates Liz Allan. As time passed Liz grew more interested in Peter but continued to date Flash. After graduation Liz dumped Flash. Liz went on to marry Flash's former roommate Harry Osborn. Flash briefly dated Gwen Stacy before he went on his first tour of duty. Flash is briefly romantically involved with Mary Jane Watson in college. After he and Peter put their antagonism behind them and become friends, Flash serves as best man at Peter and Mary Jane's wedding. Flash had a long relationship with Sha Shan, a girl he met in Vietnam. They lived together for some time, but their relationship became distrustful and strained. Flash eventually cheated on her with Betty Brant. When Sha Shan learned the truth, Flash hit her and she left him. Years later she showed up as his physical therapist. He has a long, on-and-off relationship with Betty Brant. Ever since the 1980s, they have broken up and gotten together four times. Felicia Hardy dates him in order to make Peter jealous, but is surprised when she actually falls in love with him. She eventually proposed marriage to him but Flash breaks up with her, as he feels he cannot keep up with her high-speed lifestyle. He has started a relationship with fellow Secret Avenger Valkyrie. The Venom symbiote grows a pair of legs for him while he has on the suit. Due to his military training and former boxing career, Flash is an experienced hand-to-hand fighter and a trained marksman. In the House of M: Iron Man series, Flash is a commentator for 'Sapien Deathmatch'. This is where sentient beings fight violent battles for the entertainment of the mutant ruling class. In his first noted performance, Flash narrates a battle between a robotic Sentinel and the human Tony Stark. In the MC2 continuity (the alternate future of Spider-Girl), Flash Thompson is now on the faculty of his old high school. He is the coach of the girls' basketball team. He married Felicia Hardy, but they later divorced after they had two children (Felicity and Eugene Jr.). He still is unaware of the fact that Peter Parker was Spider-Man, and is similarly unaware that Peter's daughter is Spider-Girl. Felicity, on the other hand, is aware of all of this and briefly assumed the Scarlet Spider identity in attempt to partner with Spider-Girl. In Spider-Man Loves Mary Jane, Flash is the star football quarterback at Midtown High. Flash bullies Peter and refers to him as Puny Parker. Flash recently started dating Liz Allan again; this ended after she dumped him at homecoming for declaring his love to Mary Jane in front of the whole school. Flash's version is named Gene and is in a relationship with Sarah Jane (the universe's Mary Jane's). Like his counterpart, he bullies Patton Parnell (the Peter Parker of the Universe). Earth-11 version of Flash Thompson is far more friendly to Penelope Parker (Earth-11's Peter Parker), even before the spider bites her or after she became Spider-Girl unlike most of his other counterparts (notably Mainstream, Ultimate, Indian, and mostly TV series/Movie trilogy universes) who start as bullies at first towards Peter Parker and his counterparts, then reform of being admired by the Spiders' heroism afterwards. A version of Captain Spider appears in the spider-themed heroes recruited by Spider-UK to help combat the Inheritors. He is killed by Morlun. Flash Thompson (as Agent Venom) is the main protagonist in this Secret Wars Warzone version of Spider Island. He leads the resistance after most of the heroes and citizens have been mutated into spider monsters by the Spider Queen. Inspired by the sacrifice of Spider-Man, he leads the resistance (consisting of Werewolf by Night, Jessica Drew, and Vision) into stopping the Queen. His plans to release some heroes from the Spider Queen's control by mutating them into other monsters (such as Curt Connors' Lizard formula and Morbius' vampire formula) succeed and he is able to get monstrous versions of Captain America, Captain Marvel, the Hulk, and Iron Man on his side. When they go get Stegron to help in the cause, they discover Spider-Man's alive and Flash finds out he's Peter Parker. They rescue both to help in their cause. Flash eventually leads the rebellion to successfully stop the Spider Queen, but at the cost of his own life (due to requiring the symbiote to possess the Spider Queen to take her down). Peter becomes the new baron of the place and plans to honor Flash's memory. The Ultimate Marvel incarnation of the character is Fredrick "Fred" Thompson, a high school jock who bullies Peter Parker and hangs out with fellow student Kenny "Kong" McFarlane. Unlike most versions, he does not idolize Spider-Man (something that Kenny does instead). When Flash challenges Peter to a fight, Peter merely blocks a punch from Flash and manages to break his hand. When Peter joins the basketball team, Flash's attitude changes as he's loyal to his teammates. When Flash suddenly wants to talk to Peter alone for a moment on at least two occasions, Peter turns him down rather furiously, believing he just wanted to bully in private. After Gwen Stacy's death, It was revealed that he had a crush on Gwen and was actually trying to ask Peter for help in approaching Gwen for a date. During Silver Sable's hunt of Spider-Man, Flash is kidnapped after being mistaken by the Wild Pack for Spider-Man having only moments before disappeared into an alley Flash happened to be standing in. After realizing their mistake, the group considered killing him but Flash is able to escape. This experience gives Flash a new level of popularity within the school especially after a TV movie is made about his ordeal. After Peter's apparent death as Spider-Man, Flash realizes that he's the only one didn't know that his former bullying victim and the young hero are the same person. In "What If the Radioactive Spider Had Bitten Someone Else? ", Flash is one of three characters - along with Betty Leeds and John Jameson - who is bitten by the radioactive spider which gave Spider-Man his powers, instead of Peter. After inadvertently killing the wrestler Crusher Hogan in the ring due to his underestimating his new strength, Flash begins to fight crime under the name "Captain Spider", but his career comes to a brutal stop when he fights the Vulture, is knocked out of the sky and - without any webshooters to save him - falls to his death. Only Peter bears witness to his demise. In "What If Peter Parker had to destroy Spider-Man?" a darker twist to the "Captain Spider" story is depicted, with Flash still possessing his aggressive, selfish bully attitude from his early appearances. As Peter witnessed the spider-bite, he becomes Flash's confidant, and Flash strong-arms him into making a costume and weapons. Not wanting Flash to harm anyone permanently, Peter devises the web-shooters, but Flash uses his powers to become a super-criminal called "The Spider". A pep talk from Aunt May and Uncle Ben inspires Peter to do something, using his scientific genius to create a robotic exo-skeleton (similar to Doctor Octopus' tentacles) and other methods which let him counter Flash's powers and incapacitate him. Later, Mr. Fantastic removes Flash's powers and remarks that Peter has a bright future ahead of him. In "What if J. Jonah Jameson adopted Spider-Man? ", JJJ adopts Peter after Chameleon's attempt to hijack a NASA shuttle resulted in the deaths of Aunt May, John Jameson, and Chameleon himself. Jameson hires Flash to be Peter's bodyguard, writing off their antagonism as youthful energy. Because Jameson remains convinced that Spider-Man is to blame for the shuttle accident, he hires Spencer Smythe to create the Spider-Slayers, only for Peter to sabotage them in secret. At the demonstration, Flash notices that Smythe has also created the Scorpion suit and takes it for himself, hoping to protect Spidey and possibly become a hero in his own right. However, the serum affects Flash's mind, causing him to go berserk, and Peter (now maskless) goes to try to bring him down. Blinded by rage and addled by the serum, Flash refuses to believe that "Puny Parker" could be Spider-Man and attacks, nearly killing Peter until Jameson intervenes using a remote-controlled Spider-Slayer robot and shoots Flash with an antidote dart. The television show Spider-Man and His Amazing Friends was Flash Thompson's first animated appearance, voiced by Frank Welker. In the episode "Video-Man", he finds out that Angelica Jones is actually Firestar but he is unable to remember that in the end. In the episode "Spider-Man Unmasked", Sandman learns Spider-Man's true identity to which Firestar tricks Flash into wearing a Spider-Man costume to a party which successfully mislead Sandman into thinking it's made a mistake. In the end, Flash tries to take some credit in Sandman's defeat but Peter Parker throws him some sand, scaring him. Flash Thompson appeared in the 1994 Spider-Man: The Animated Series, voiced by Patrick Labyorteaux. This version tries to have a relationship with Felicia Hardy, which did not work out and he later found a new, more comfortable, relationship with the brainy Debra Whitman. Flash does not physically bully Peter Parker but insults him on various occasions. He is also a fan of Spider-Man as he did not believe J. Jonah Jameson's news when the Insidious Six were on the rampage when the web slinger was framed by the Chameleon. Although Peter and Flash continue their rivalry, he is invited to Peter's wedding where he meets Felicia again. Flash tries to get along with other beautiful girls but always fails, sometimes being pushed back by Debra. Flash Thompson appeared in Spider-Man: The New Animated Series, voiced by Devon Sawa. This incarnation's dislike for Peter Paker that is actually pushed to a new extreme; the episode "Flash Memory" shows Flash's insults up front and is shown to be even willing to endanger Peter's life. Flash Thompson appears in The Spectacular Spider-Man, voiced by Joshua LeBar. Just like his original portrayal in the comics, this version is a star high school football player and a typical jock and bully who mercilessly bullies his nerdy classmate Peter Parker but greatly admires the costumed superhero Spider-Man, an irony in which the young superhero takes some gratification. He continues to bully Peter, even after his nerdy classmate has already been bitten by the radioactive spider and Flash is always trying to outsmart Parker but usually fails. In season one, he dates Liz Allan until they break up, seemingly due to Liz developing a crush on Peter. Due to losing a bet to Peter, he had to be a cheerleader for Halloween but convinced the rest of the football team into also dressing as cheerleaders. 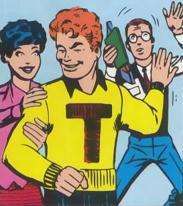 He and Mary Jane Watson had also been voted the king and queen of the Fall Formal, which leads him to try asking out Mary Jane but Mary Jane denied him due to not wanting an actual relationship. After seeing Peter dressed as the web-slinger (which Peter claims was a Halloween costume to protect his own identity), he argued that Peter looked nothing like his idol and he himself should have dressed up like the wall-crawler. When Peter gets angrier and easily agitated from the Symbiote, it's Flash that snaps Peter back into reality by reminding Peter that his own friends only want to help. Flash later shows his more heroic side when he and his friends help save Gwen Stacy from falling to death at the Thanksgiving Day Parade because of Venom. In season two, Flash is shown to have an attraction to Sha Shan Nguyen. It is also revealed that he and Peter were best friends in Nursery School; It was Peter that gave Flash his trademark nickname because of his tendency to streak as a little boy. Although Sha Shan does not want anything to do with him at first, Sha Shan eventually went out with Flash after he reported Harry Osborn's Gobulin Green usage on the team, feeling that it's better that he earn trophies fair and square. Flash also auditioned for St. John Devereaux's school play. Although he botched his initially audition, Flash dressing as Spider-Man ultimately got him the role as the play's comic relief. Flash Thompson appears in the Ultimate Spider-Man cartoon series, voiced by Matt Lanter (as Flash Thompson / Agent Venom) and by Logan Miller (as the kid version briefly seen in "Beetle Mania"). This version, much like his original incarnation, is a typical bully who picks on Peter Parker yet idolizes Spider-Man. However, lacks the previous television incarnations' redeeming quality and hot-headed bravour and is instead portrayed as a coward who deliberately leaves people behind. His favorite school sport is 'locker-knocker time' where he locks Peter in his own locker. He also seems to harass Harry Osborn and Mary Jane Watson as well. Throughout season one, he is sometimes an accidental target for super-powered characters that Spider-Man encounters (possibly due to karma): Spider-Man has Flash lock himself in his own locker during the Frightful Four's attack on Midtown High School in "Great Power", briefly was a host for the Venom symbiote created for Norman Osborn in "Venom", Taskmaster actually thought that Flash and Harry could be Spider-Man in "Why I Hate the Gym", gets his first comeuppance when Wolverine (transplanted into Peter's body by Mesmero) gives him a sound pounding after trying to bully once more in "Freaky", and hides in Phil Coulson's principle office during Thor's and the Executioner's hunt in "Run Pig Run". In the episode "I Am Spider-Man", Flash is given moral support as Spider-Man by Peter during Mary Jane's school play. Despite their enmity and the Trapster mistaking Flash for the web-slinger, Flash shows signs of reforming his character. In season two, Flash's positive development continues. In the episode "The Rhino", his bullying motivated Alex O'Hirn's transformation into the Rhino to seek revenge on Flash but is saved by Spider-Man and Power Man. Realizing that his bullying towards others has consequences, Flash apologizes before Alex is taken into S.H.I.E.L.D. custody. Agent Venom makes his animated debut on Ultimate Spider-Man: Web-Warriors. Wanting to emulate his idol Spider-Man, Agent Venom has all of Venom's abilities (sans Venom's host control as Flash's own will overrides the symbiote's) and is even able to assimilate technology into himself. In his self-titled episode "Agent Venom", Flash tries to fight crime as the "Scarlet Spider" albeit without powers. During Spider-Man's hunt for the mass-produced Venom symbiote created for Loki, Flash (as Scarlet Spider) tries to assists Spidey against a Venomized Scorpion. As the Venom samples were contained by Spider-Man, another sample latches itself onto Flash's foot. The next day when the Beetle attacks Midtown High to retrieve the symbiote, following Flash donning his football gear for impact protection, the organism covers its new host, pads and all. During his first battle and while also learning of his new powers, Agent Venom assimilates Beetle's technology (missile launchers and parts of armour) to evolve his own suit atop his football gear. Agent Venom battles Beetle while Spider-Man fights Taskmaster. Agent Venom almost loses his mind to the Venom symbiote when Beetle uses a sonic disruptor but manages to fight for control much to Spidey's surprise. He defeats Beetle while Taskmaster retreats. Realizing the consequences of being a hero, he attempts to remove the symbiote with vocal commands (i.e. 'Venom away') but fails and Spider-Man realizes that the parasite is stuck as Venom has chosen its permanent host. Although he is then locked up by S.H.I.E.L.D., Spider-Man persuades Nick Fury into releasing him. Subsequent episodes depict Agent Venom as a member of the New Warriors alongside Iron Spider, Squirrel Girl, Ka-Zar, Zabu and Cloak and Dagger. Agent Venom (and his teammates) assists Spider-Man in fighting a super-powered team and a several supervillains (respectively led by Taskmaster and the Green Goblin). He also assist Spider-Man, Iron Spider, Power Man and their S.H.I.E.L.D. teacher Whizzer in combating Arnim Zola's monsters. Agent Venom soon plays the role of the Rhino's release to join the New Warriors. However, Alex still thinks Flash is still the same bully before. With the Hulk's help, Agent Venom and Spider-Man are able to reform Rhino into joining the New Warriors. During the four-part "Contest of Champions" season finale where Agent Venom and Iron Spider are among the many 'chess pieces' between the Collector and the Grandmaster, Flash and Amadeus Cho learn that Peter is Spider-Man. Agent Venom continues to serve as a supporting character in Ultimate Spider-Man vs The Sinister Six. Along with Spider-Man and Iron Spider, he welcomes Scarlet Spider (Ben Reilly) and Kid Arachnid (Miles Morales) into the Web-Warriors group and S.H.I.E.L.D. Academy. In "Double Agent Venom", Doc Ock removes the Venom symbiote from its host, however, Flash later re-merges with the organism again with Agent Venom's redesign resembling his first costume appearance from the main Marvel universe. In "Anti-Venom", Agent Venom gets injured when Spider-Man and Iron Patriot go against Doc Ock and Anti-Venom. In the two-part "New Sinister Six", Flash uses a wheelchair (equipped with an arsenal) as he recovers to defend himself like when Scarlet Spider's true allegiance with Doc Ock is revealed, protecting May Parker only to get knocked out by Doc Ock until Spider-Man arrived saving both Flash and May. In the three-part "Symbiote Saga", Flash finally recovers from his injuries. However, Michael Morbius collects a Venom sample to create a new Carnage symbiote, and that chaotic symbiote's creation reacts with the Venom symbiote and has Flash follow to the HYDRA base where Carnage's experimentation occurs. As the Venom symbiote reacts by displaying a fear of Carnage's chaotic nature, Flash's own personal fears make himself powerless while trying his best. By the time Carnage's hostless form attempts to cause chaos as Spider-Man tries stopping Carnage, Flash regains his courage and manage to transform back into Agent Venom. Though both Spider-Man and Agent Venom stop Carnage by using Sonic Blaster speakers at a high audio intensity, they soon realize that this symbiote is created to be a 'bomb' to burst apart to infect other hosts. Fortunately, Agent Venom and Spider-Man are soon reinforced by Captain America, Iron Fist, Cloak and Dagger. The heroes are unexpectedly get an uneasy reinforcement from Anti-Venom, still attacking Agent Venom until Harry gains control of the Anti-Venom symbiote to sacrifice to cure many civilians from mass-produced Carnage symbiote, then reveal Flash's secret identity to Harry after Peter's. Bittersweetly, the Carnage symbiote reassembles into one giant form that subsequently engulfs Midtown High where Agent Venom, Spider-Man, and the Patrioteer go to rescue Mary Jane from the vampire-like Morbius. To save Mary Jane from the Carnage Queen's control, Flash, Harry, and Peter sacrifices their respective identities. Flash Thompson appeared in the 2002 film Spider-Man, played by Joe Manganiello. This version is depicted as Mary Jane Watson's boyfriend at the start of the film and is a bully who torments Peter Parker. After Peter accidentally uses a web to splash Flash with a tray of food, a fight between them breaks out in the school's hallway which Peter wins albeit accidentally by discovering his new powers and sending Flash down with just one punch enough for the teacher he stopped by to accidentally drop his food on him. Mary Jane later tells Peter that Flash was grateful that Peter didn't give him a black eye for graduation. At graduation, he and Mary Jane break up. Joe Manganiello reprises his role in a silent cameo at the end of the 2007 film Spider-Man 3 where he attends Harry Osborn's funeral and is visibly saddened by his former classmate's death. Chris Zylka portrays Flash Thompson in the 2012 reboot film The Amazing Spider-Man. This version is a basketball player rather than a football player and still picks on Peter Parker, even beating Peter up at lunch in front of everyone. However, once Peter receives the spider powers, Flash gets humiliated during a basketball practice session as retribution. Flash later starts acting nicer to Peter, starting by sympathizing with Parker after Ben Parker's death. By the end of the film, Flash is implied to now be Peter's friend and expresses admiration for Spider-Man. Chris Zylka reprises his role in the 2014 sequel The Amazing Spider-Man 2. Initially cut from the final film, one of the deleted scenes titled "Flash Forward" in the Blu-ray bonus features shows that he and Peter Parker are friends. Chris Zylka has also expressed interest in having his character as Venom in the spin-off film Venom. This film has since been cancelled along with various other Sony-exclusive Spider-Man movies. Tony Revolori will portray Flash Thompson in Spider-Man: Homecoming (2017). Agent Venom appears as a playable character in the Facebook game Marvel: Avengers Alliance. Agent Venom is a playable character in Marvel Super Hero Squad Online. Agent Venom is a playable character in Spider-Man Unlimited. Agent Venom appears as an ambush enemy in Marvel: Contest of Champions. Agent Venom appears as a team-up in Marvel Heroes, voiced by Crispin Freeman. Flash Thompson was originally portrayed by Matt Caplan in the 2010 Broadway production Spider-Man: Turn Off the Dark. ↑ James, Adam (12 September 2012). "Way and Dillon Confirmed For Marvel NOW! "Thunderbolts"". Comic Book Resources. Retrieved 12 September 2012. ↑ As noted by Daniels in Marvel: Five Fabulous Decades of the World's Greatest Comics (p.130) Ditko's plotting emphasized the more subtle aspects of human relationships, stressing (for example) Aunt May's quiet strength over Flash's macho posturing. ↑ Sanderson, Peter (2007). The Marvel Comics Guide to New York City. New York City: Pocket Books. pp. 30–33. ISBN 1-4165-3141-6. ↑ Ching, Albert (January 28, 2011). "Marvel 'Next Big Thing' - Rick Remender on VENOM - LIVE!". Newsarama. ↑ "The Next Big Thing: Venom". Retrieved 2011-02-01. ↑ "Remender, Hardman add Venom, Captain Britain to "Secret Avengers"". Comic Book Resources. November 10, 2011. ↑ Arrant, Chris (July 20, 2013). "DisneyXD's ULTIMATE SPIDER-MAN Renewed For 3rd Season, HULK-S.M.A.S.H. Clip". Newsarama. ↑ "Christ Zylka as Flash Thompson". movieweb.com. Retrieved 25 November 2010. ↑ Truitt, Brian (July 24, 2016). "Comic-Con: 'Captain Marvel,' 'Black Panther' boost Marvel diversity". USA Today. Retrieved July 24, 2016. ↑ "Team-Up with Agent Venom!". MarvelHeroes.com. Gazillion Entertainment. 29 January 2016. Retrieved 11 October 2016. "Flash's Profile at Spiderfan.org". Retrieved September 29, 2010. "Flash Thompson on the Marvel Universe Character Bio Wiki". Retrieved September 29, 2010.